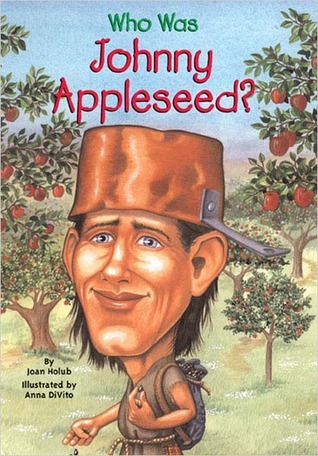 To many, Johnny Appleseed is nothing more than an American fairytale, of the ilk of John Henry or Babe the Blue Ox. The cartoon image of a barefoot guy wearing a pot on his head throwing apple seeds around is rather crazy. While historians agree that this image of Appleseed was an exaggeration, it actually wasn’t too far from the truth. 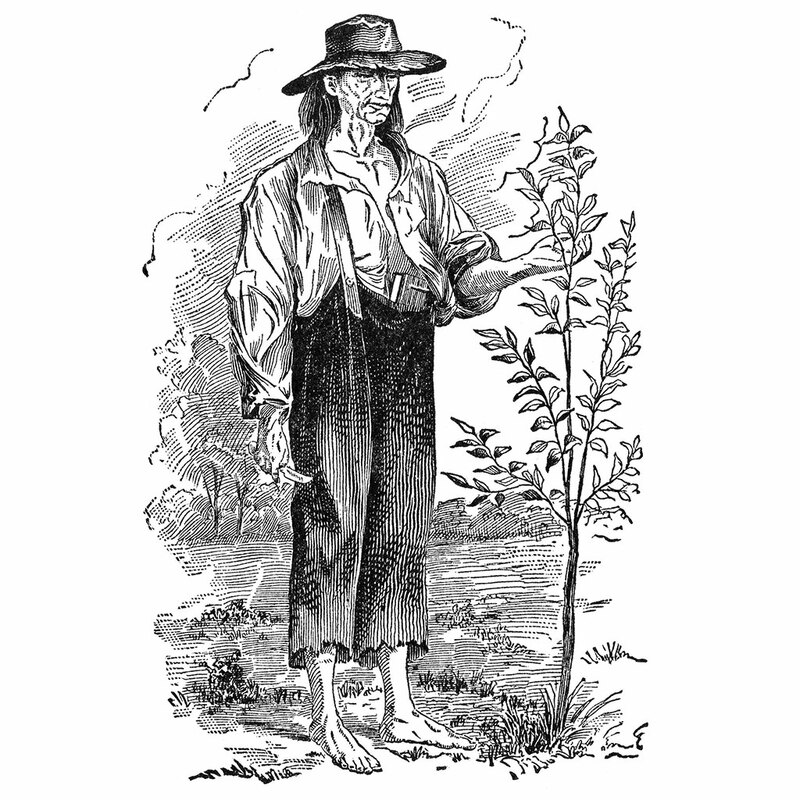 Johnny Appleseed, real name John Chapman, did wander the frontier with bags of apple seeds, planting hundreds of thousands trees along the way. But Appleseed’s apples weren’t for eating, they were for drinking... in an intoxicating glass of hard apple cider. While much of Chapman’s early past is lost to history—other than his birth in 1774 in Leominster, Massachusetts, about fifty miles east of Boston, little is known besides that he and his half-brother made their way west in pursuit of America’s new frontier around 1792. That same year, Congress donated 100,000 acres, known as the “Donation Tract,” to the Ohio Company of Associates as a way to encourage trade and buffer the lands from “Indian intrusions.” In response, the company offered a free hundred acres of land to anyone willing to settle in these lands with only one caveat: The settler had to plant 50 apple trees on the land. Since apple trees typically take ten years to grow, this proved the settlers commitment to the land. When Chapman arrived out west, he came up with a simple, yet brilliant business plan: Claim as many homesteads as he could, deposit apple seeds and nurse them for growth. Then, he would turn around and sell the homesteads to settlers, after doing the dirty work - a sort of19th century house flipper. Contrary to the myth of that he indiscriminately planted seeds, Chapman was actually quite meticulous about it. He protected every orchard with a barbed fence to keep out deer and thieves. He also had incredible knack for anticipating where the settlers and frontier would go to next, always able to get to the unsettled land ahead of them to plant his trees and claim the land. The apple seeds Chapman planted were also unusual in that they were never meant to produce edible fruit. Grafted apple trees had been around for thousands of years, the concept coming to the New World with European colonists. By “grafting” trees together, new varieties are grown - sort of like how combining primary colors creates whole new colors. Chapman didn’t believe in grafting trees due to his membership in the Swedenborgian, or “New Jerusalem,” Church. One of the founding tenets of this religion was that all animals and plants are living things and shouldn’t suffer. Therefore, grafting and cutting trees to create apple varieties were, to them, considered “wicked” and “unnatural.” So, Chapman planted all of his orchards straight from seed, which meant that his “wild apples” were often bitter and gnarled. There was only thing one could do with so-called “spitter” apples, mash them up to make hard apple cider. For well over a century, cider was this nation’s alcoholic beverage of choice. According to Slate, the average Massachusetts citizen in 1767 drank 35 gallons of cider. Additionally, in a time when water’s cleanliness wasn’t ensured, cider made from fermented apples was sure to be safe. “Hard cider,” Appleseed biographer Howard Means wrote, “was as much a part of the dining table as meat or bread.” As noted by Smithsonian, planting cider apple trees also made more economical sense, especially on the frontier, then grafting for tastier apples. Hard apple cider was in higher demand. When John Chapman died in 1845, he immediately entered into American folklore. His obituary ran in newspapers across the country, calling him by the nickname that has continued to persist for decades. Today, many of the trees that Chapman planted a century and a half ago no longer exist - except one. On a farm in Nova, Ohio, lives the last surviving apple tree planted by Johnny Appleseed. It’s believed that Appleseed sowed these seeds approximately 170 years ago during the presidency of Andrew Jackson. So, next time you are in the unincorporated community of Nova, about 55 miles southwest of Cleveland, pay a visit to the real-life offspring of Johnny Appleseed’s legend. And don’t forget your hard apple cider.